Raleigh County News outlet – the Register Herald – dropped by our multi-media factory to do a nice piece on the day of our grand opening at KITB Media. 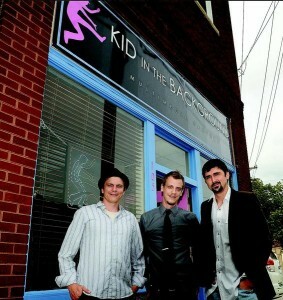 Kid in The Background, a business new to Beckley, hosted a grand opening and ribbon-cutting ceremony Wednesday at its office at 105 W. Prince St. Kid In The Background, a multimedia factory, offers graphic design, video and audio production, marketing, digital media, social media, booking and promotions and brand management services. With a combined 40 years of experience in media and entertainment, the three artists who own the company offer 100 percent original content to clients. The team is: Jamie Smith, account management, web design and audio production; Jason Lockart, graphic design, marketing, and artist management; and Sean Udy, video production, photography and motion graphics. Kid In The Background owners say they are committed to producing high quality and timely results, maintaining open lines of communication for clients and complete client satisfaction. Click Here to read the the online version of the article.